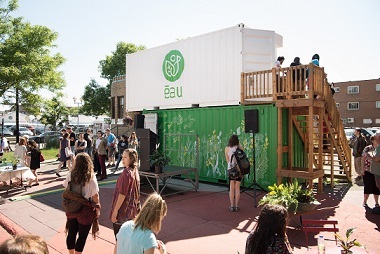 Quebec’s very first vertical aquaponics farm was launched at Place Shamrock in the Jean Talon Market, on June 15, an initiative by a social enterprise called ÉAU (Écosystèmes Alimentaires urbains). After two years of hard work, this is a dream come true for entrepreneurs Émilie Nollet, a PhD student in Administration (majoring in Management) at HEC Montréal specializing in environmentally friendly food production and efforts to combat social exclusion, and Olivier Demers-Dubé, an urban agriculture and aquaponics expert. At the launch, they introduced some 250 participants to their agricultural and urban revolution. Their educational farm, created from a sustainable development perspective, combines aquaculture technology with hydroponics, one of the world’s most efficient production methods, to grow fresh, local and organic produce. The Place Shamrock farm also meets circular economy criteria, since it was built using recycled containers. It has some 400 fruit and vegetable plants growing on the upper level, while 500 tilapia are being raised on the lower level. The Place Shamrock educational farm, in the Jean Talon Market. Agrifood farming based on aquaponics combines aquaculture (raising aquatic animals, like fish) and hydroponics (growing plants without soil). This ecological approach uses 80% less water than industrial agriculture, and is possible year-round, among other advantages. The fish, fruit and vegetables grown in this way are produced without any fertilizers or pesticides, making for a healthy and balanced diet. 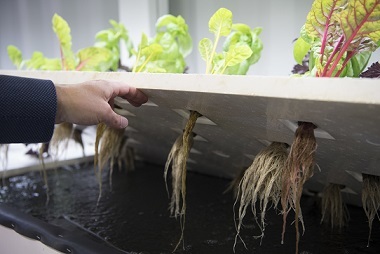 “Aquaponics is still relatively unknown to the public and to researchers. That’s perhaps because it combines several fields of expertise (fish farming, horticulture, greenhouse production, etc.) and is itself a new science that we’re just starting to explore. Right now it’s like the first computers, back when you had to be an engineer to make the system work. With ÉAU, we’re committed to conducting R&D to make aquaponics the MacBook Pro of food production systems, and to make it widely available,” Demers-Dubé explains. To get their project off the ground, Nollet and Demers-Dubé called on the experts at the National Bank | HEC Montréal Institute for Entrepreneurship (IEBN), as part of the National Bank – HEC Montréal Accelerator program, to develop an economically viable urban agriculture business. The Accelerator program, founded to support entrepreneurs and accelerate innovative business ideas, helped them create a solid company that reflects their commitment to urban agriculture. “The Institute’s team led by Manaf Bouchentouf coached us, helping us to weed out our weaker ideas and focus on more promising ones when we were starting out. Thanks for believing in us and in our potential, for encouraging us!” said Nollet at the launch. Products grown at the ÉAU farm will be available from June to October 2016. Any surplus will go to local organizations. The company is also planning guided tours and workshops to introduce people to urban agriculture, a varied program that is sure to give all visitors to the farm “food” for thought. Some of the plants grown on the ÉAU farm. Lastly, HEC Montréal is proud to salute the drive and enthusiasm of this innovative social enterprise, and hopes that ÉAU’s founders will have a productive summer!